All about the Miniature Australian Shepherd and what to expect from a Mini Aussie Puppy from Breezemore in Maine! The Miniature Australian Shepherd is an Australian Shepherd in a smaller package, standing just 14 – 18 inches tall at the shoulder and weighing an average of 15 - 30 pounds. The smaller size makes them well suited to our growing urbanization. They still possess the same traits that they were originally bred for; the Australian Shepherd was bred to herd livestock and guard the family farm. The primary goal when breeding (past and present) the Mini Aussie is to preserve these traits, keeping them an intelligent family oriented dog… just in a smaller package. The smaller size (“miniaturization”) was accomplished like any other breed or variation: selective breeding over time. Small standard Aussies bred with other small standards eventually led to the Minis and Toys we have today. It was not accomplished, as some claim, by crossing the breed with other smaller breeds of herding dogs. An Aussie is an Aussie, small or large. The majority of our pups fall within the mini range of 14 – 18” at the shoulder when full grown. We do have one, sometimes two, pups in our litters that fall into the Toy range. Toy pups will be less than 14 inches at the withers (shoulders) when full grown. Because the Minis and Toys are bred down from the Standards we may have the occasional pup that goes over the 18” size. Though I cannot guarantee the adult size of your pup, I will give you my best guesstimate at what you can expect for adult size and weight. Black: With or without white and/or copper trim. Kylie is an example of this color.Red: With or without white and/or copper trim. The reds can vary in shade from very light to so dark that they can appear nearly black. Our Lily and Jazz are both red tris but they are definitely different shades of red. Jazz is a deep chocolate red, showing how dark a red tri can be. Blue Merle – with or without white and/or copper trim. Eli is this color. Red Merle – with or without white and/or copper trim. The coat can come in two varieties: Show coats and working coats. Both do shed, with the show coat being more noticeable. Our girls with working coats don’t mat but Kyle, who has a show coat, can get mats around her ears and chest if she doesn’t get a brush at least once a week. For more in depth information regarding coloring of Aussies please go to ASHGI.org where you will find a lot of information regarding coat, eye color and genetic anomalies for the Australian Shepherd. Like all dogs, the Mini Aussie doesn't look much like a dog at birth. They tend to look like mice/guinea pigs. While some puppies (like our Kyle) have a natural bobbed tail, it is at this young age that those that don't will have their tails docked in keeping with the heritage of the breed standard. At about 4-5 months of age your puppy will go through their Teenage gangly stage. Their legs get long, their ears go all funny and they shed that cute fluffy puppy coat. Within a short time though, they will grow into their legs, the ears will settle and their brand new adult coat will start to come in. Your little pup will start to show the promise of a handsome adult Aussie. Mini Aussies are loving and devoted to their family, they are referred to as velcro dogs because of their want to be with you all the time. They are happy to follow you around the house, even when you’d much rather not trip over them. 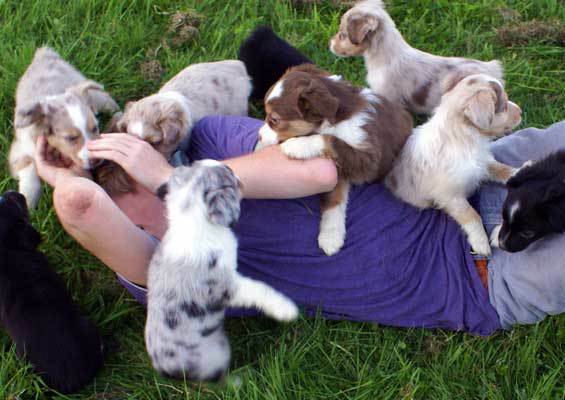 Australian Shepherds are generally reserved with new acquaintances, this is a breed characteristic. While this makes them a wonderful guardian of home and family, it does require early socialization. It is important to encourage your pup/dog to meet new people, new situations and other animals. Puppy obedience classes are great start, remember your Aussie is smart and sensitive, positive training methods are a must. Aussies will work hard to please you. The Miniature Aussie, though not a hyper dog, is active and wants to have something to do. Though they can be quite content to join you on the couch for a cuddle and snooze, they do require exercise and activities. Unless you provide them with exercise and busy toys, they will find their own entertainment. A full kitchen trash can keep a Mini Aussie busy for an hour or two, a box of tissues or roll of paper towels can be great fun. They make excellent paper shredders. Daily walks, a game of catch (their leaps are amazing) or maybe a run is generally all that's needed. Mini Aussies excel in performance venues, their intelligence and athletic abilities make them well suited for agility, fly-ball, Frisbee, obedience and therapy work. Our Miniature Australian Shepherds are registered through the National Stock Dog Registry (NSDR), American Stock Dog Registry (ASDR) and AKC as Australian Shepherd.